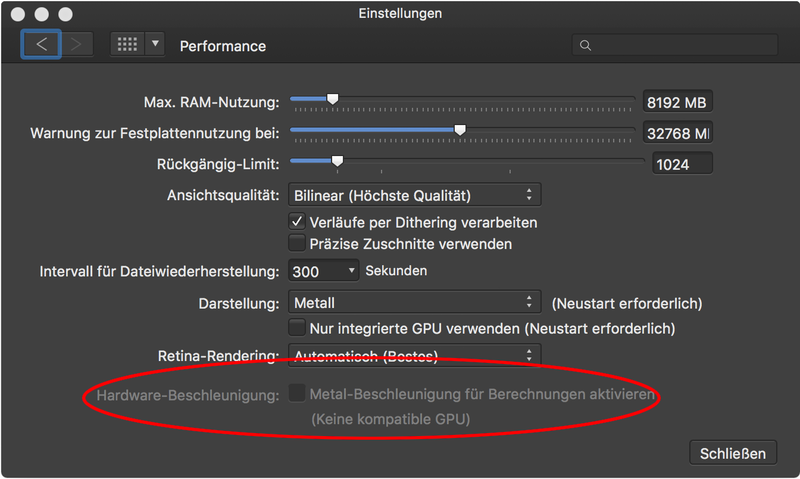 When I enable Metal in the preferences the HW acceleration on the bottom is disabled due to "incompatible GPU". GPU is the built in Radeon Pro 580 8 GB. There's a know issue/bug with that graphic card when using Metal if i'm not wrong (i'm checking/searching for bug details). Please use OpenGL instead for now. it seems that this bug is not only with the Radeon Pro 580 but also with the Radeon R9 M295X. Is there any timeframe known when this bug is resolved? thanks for the quick reply. So I have to wait patiently for a fix. Does it make sense to chose "Metal" for Darstellung when Hardware-Beschleunigung for Metal is disabled? thanks for the fast answer. I've tested the Metal-Option on my two macOS-Systems. -> No hardware acceleration option in AP available?! As soon as AP has been started on system 2, the system switches to the AMD GPU. Test with the lightning filter showed a filter representation smoothly in real time without artifacts (like with AP on the latest iPad Pro). The CPU load was about 20% while the filter moved wildly. On system 1, the same filter showed artifacts and jerked noticeably. The CPU load temporarily reached 100% while the filter was moved. I deactivated the hardware acceleration in System 2 in the settings and promptly showed the same behavior as in System 1 (high CPU load and artifacts while the filter is moved). I can reproduce this on an "iMac (Retina 5K, 27'', ultimo 2014)" with the 4 GB Radeon R9 M295X. Metal can be selected from the popup menu, but the filters don't seem to work any faster. The bottom area for Metal is greyed out as well. Are there any news regarding this issue/bug? I'm seeing the same issue on my iMac (27-inch, Late 2013) with NVIDIA GeForce GTX 780M GPU. I can select Metal, but performance stays about the same (actually, it gets slightly worse). The Metal acceleration option is greyed out. The problem is not only related to the grayed-out option, but also to the fact that the performance with metal is equal or even worse than with the other available options. At first glance, it seems as if Metal doesn't use any hardware acceleration in Affinity Photo with the specified graphics cards, although the graphics cards could. In other words, the announced metal-supported performance of Affinity Photo on a MacBook Pro is quite impressive, while on the iMac it's simply bad although the graphics cards are with macOS native metal-supported. I'd like to echo part of what gkoeder said above: Metal performance on my iMac is definitely not better, and in my specific case it's worse. It's not terribly worse, be it's definitely noticeable. Other apps on my iMac run significantly faster now with Metal, so I'm just assuming there's a bug somewhere in the Affinity apps. on Serifs website Mac Optimisation with Metal 2 support is claimed. I couldn't find a hint to the fact, that this is only true for very few Mac models. I'd really have liked to know this before my purchase. It wasn't a bad one, though. It's just ironic, that all the big iMacs or even two year old models don't support Metal acceleration for AP, but even the cheapest 13" MacBook Pro 2017 does, and with it outperforms the most expensive MacBook Pro 15" from 2014. The issue must be resolvable by Serif, as Apple states full Metal support under system report. I am working with the latest MacBook Air, so I am quite underwhelmed by the performance. Please add software support for Metal graphics acceleration. Or tell me that it is Apples fault, which I would need good evidence to believe. My 13" 2015 MBP features a Intel Iris 6100 that is Metal-capable according to system profiler. I can select "Metal" for "Display" but for "Hardware Acceleration" it shows "no compatible GPU". Does this mean a 2015 MBP is too old for that? For some reason, that seams to be the case. Although not from Apples side. It's been quite hard to get information about the reason for this from Affinity. The only thing we know is that only the 2016 and older MacBooks are supported for Hardware Acceleration. The interesting thing is that, as I got it, this is only true for the Intel iGPUs. So if you have a MacBook Pro 15" 2016 or later, you'd have to deactivate the AMD GPU, which by Apple fully supports Metal and is far more powerful (and mostly what you paid for in the larger model) than the iGPU. This is also true for the large iMacs. Affinity doesn't offer Hardware Acceleration support for them, as can be seen in gkoeders post above. I hope I could help you, but all we know that Affinity doesn't offer support for your or my model, although it seems to be possible without problem. That's why I hope to make this a more popular issue in the forums, so something happens. Thanks! At least now I know it's not some problem/defect with my MBP. The decision seems strange though. Metal 2 should work on this iGPU, so I don't really see a hardware related reason for this other than Affinity might simply not (yet) include support for all Metal 2 capable devices. Would be great to know if this is the case and if one can hope for more supported (i)GPUs in future updates. I hope support will be added in the near future, but Affinity seams to be focusing on iPad versions of their Apps and Publisher right now. I agree with you on the strangeness of the decision. I own a MacBook Air with a 2015 CPU, so Photo doesn't run as fast as it could, which annoys me, as it basically renders the software unusable. I fell for the marketing promise full Metal support, but even after knowing the problem I found no page to look for the supported models in advance. So the last post was in July. Anything from the Metal side?! So does this mean that just this option (activate hardware etc.) is meant to be for a specific integrated GPU solution from Intel, or is Metal indeed not fully supported yet? Any finite info on that would be great! No, Metal is a graphics API from Apple, which is fully supported with all GPU‘s which Apple builds into its Systems. But Photo only makes use of it, when there is ONLY an intel iGPU from 2016 or later in your system. So Photo, as absurd as this sounds, runs way faster on a 13“ MBP than on a 15“ MBP, because it has a dedicated GPU. Especially the iPad Version is extremely fast, because Metal is the only option on iOS. This is 100% a problem that Serif could fix, but didn‘t for a long time. Sadly no fix in sight, as there were no Updates to the Mac Version of Photo for several months. I think Serif is focusing on Piblisher right now, maybe when that is released, resources will be re-allocated for the work on Photo. Expensive and powerful eGPU, but no help for Affinity Photo. Sadly, it seems like nothing is happening. 1.6's Metal compute support is only for a limited set of integrated GPUs typically found on the MacBook range (2016 and newer). There is currently no support for eGPUs. There is no need to disable the discrete GPU—Photo can still use this for presentation to screen whilst using the integrated GPU for compute. 1.7, however, which is currently in beta, does have extensive GPU compute support and is certainly at the point where you would see improvements in several areas. You're welcome to try the public beta here: https://forum.affinity.serif.com/index.php?/forum/19-photo-beta-on-mac/ (download link is in the latest stickied thread). It will make good use of multiple GPUs in many cases and will scale to however many devices are available to the system. That‘s great news! I am looking forward to the final 1.7 release!